There's a real sense of space in Tom Bouman's debut novel, which centres on a rural community in upstate Pennsylvania that is faced with the trials and tribulations of modern life as both meth dealers and fracking companies look to move in and make money from the area. Officer Henry Farrell grew up among self-sufficient people who lived off the land and kept largely to themselves. Ridges, forest and wilderness separates homesteads from each other, and people 'head into town' when they need things, rather than just walking to the end of their street; there's not the sardine-like living arrangements of city folk, but there is still plenty of scope for clashes as lives intertwine via business and nature (human and environmental both). Farrell is an intriguing character, a shy man who's left and returned, loved and lost, has rattlesnakes still hissing in his head, and now finds himself working for the law in the place he grew up. A place where there's money to be made and lottery tickets to be cashed for landowners partial to fracking, although Farrell knows from personal experience that promises made can be broken and a golden ticket doesn't always bring joy. When a mangled corpse is found on the land of an elderly recluse, Farrell is sucked into a murder investigation with no leads, further complicated when a colleague is gunned down. What violence has come to Wild Thyme township, and why? Farrell has to pick his way through a minefield of long-held grudges, secrets kept, and clashes between folks old and new, locals and outsiders. Many with something to hide. For me, Bouman has penned an absorbing tale that is remarkably assured. There are shades of Urban Waite, John Hart, or Daniel Woodrell in the elegant and evocative rendering of rural and smalltown life in DRY BONES IN THE VALLEY. Bouman soaks readers in the backwoods setting, giving us a vivid sensory experience as we follow his fiddle-playing, deer hunting local cop. 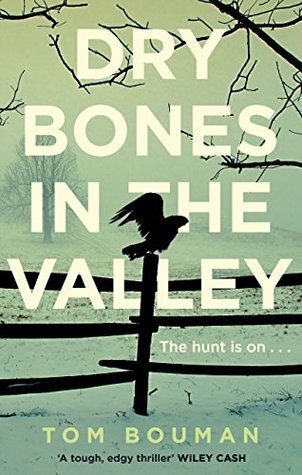 There's a real understanding and appreciation of nature and wilderness in Bouman's writing, and of the characters that populate this world, which adds a lovely texture and richness to the mystery storyline of DRY BONES IN THE VALLEY. The story tends to unfold more than racing along at helter-skelter pace, but it is gripping, and I really enjoyed the read. More than a pleasant change of pace from city-centric crime fiction, Bouman provides a fresh voice in the crime genre, as well as introducing a fascinating hero that I'd be keen to read more about in future. 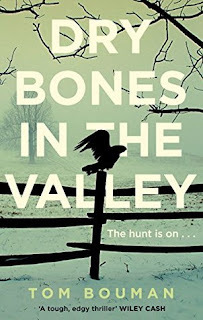 Note: I read the paperback version of this book published in the UK by Faber in early 2015, however DRY BONES IN THE VALLEY was originally published in hardcover in the United States by WW Norton & Co in 2014. The book went on to win both the Edgar Award for Best First Novel and the LA Times Book Prize for Best Mystery/Thriller.